How many times have you received an URGENT email that requires you to complete a task before the end of the day? How many times have you spent significantly longer than expected trying to chase a response, only to have to chase and chase some more to get said task done? And how many times have you reflected on such tasks only to realise the URGENT task didn’t really justify its status? If it’s more than a handful of times, don’t worry, you’re not alone. Day in, day out, more and more of us are ignoring important, significant and impactful tasks that would make a difference in favour of completing scary, (supposedly) urgent ones. Things get done when you prioritise the important over the urgent. But how can we differentiate between the two? How do we prioritise? Dwight D. Eisenhower was the 34th President of the United States. During this time, he was known for the particular way he organised his workload. Eisenhower understood that effectiveness is just as necessary as efficiency. 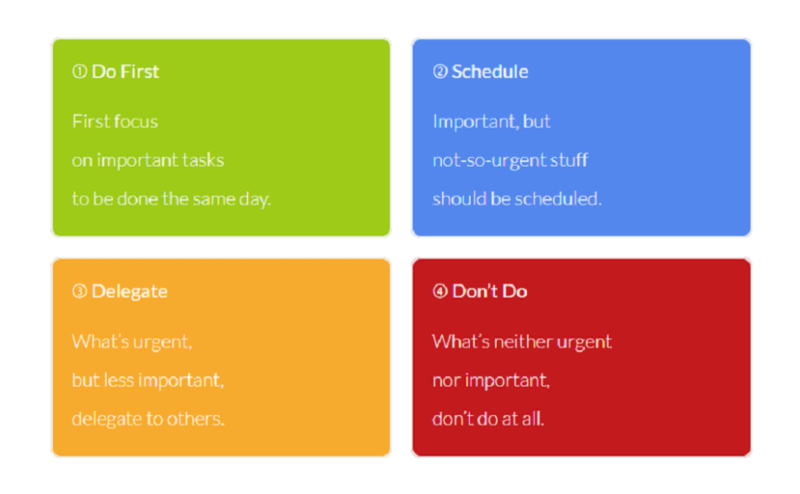 So we should dedicate our time to important tasks, not just urgent ones. 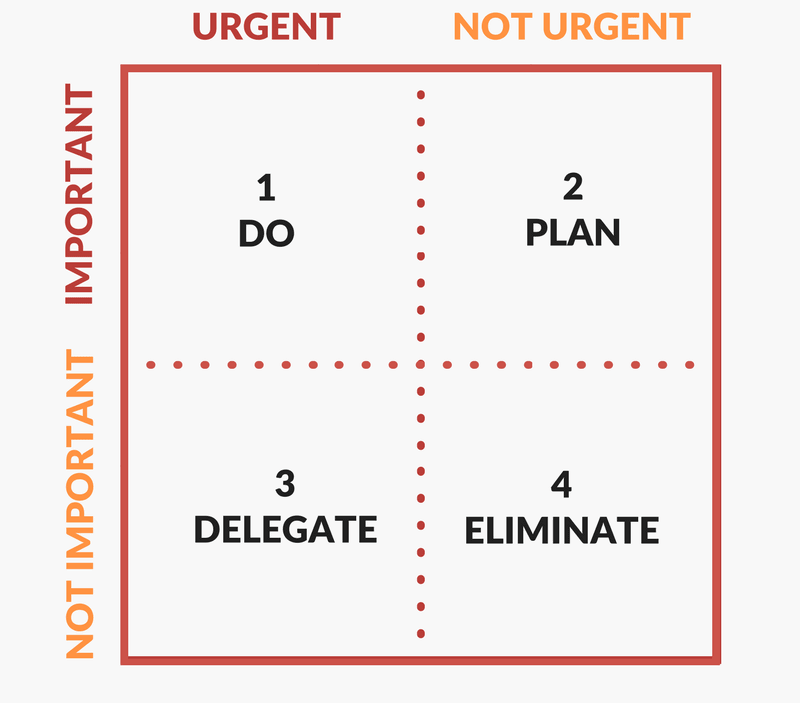 To help himself (and others) know which tasks fell into which category, he created a matrix – now known as the Eisenhower matrix. There are a couple of variations in terms of how the matrix looks, but ultimately it’s super useful to consider both at the start of your working day, as well as when ‘urgent’ tasks are thrown at you at 4:50pm on a Thursday. What does the matrix teach us? Let’s take a look at BANJO. Nope, not the musical instrument. Banjo stands for: Bang A Nasty Job Off. It might sound crude, but it’s something that most of us put off every day. By getting your least enjoyable, time-consuming task done first, you’re rewarded with an overwhelming sense of accomplishment. Simply, this technique removes trying to multitask. Each day you choose one task to focus on, even if it doesn’t take that long to complete. You write the task down, stick it on a post it or put it on a wall so it’s visible to you at all times. This way, if you’re starting to check emails or find yourself browsing Twitter, you’re brought back in the room by the sight of your one and only task for the day. And if you struggle to estimate how long a task will take, the hunter-gather method is great as it avoids putting a set time on how long a task is going to take you – you’re giving the entire day to do it. The hunter-gather technique comes from the survival tactics of hunters thousands of years ago. They didn’t have time to do anything else but hunt. If they didn’t hunt successfully, their family didn’t eat. They didn’t have time to procrastinate or let their mind wander – they had one task for the day and one only. If you don’t finish writing that case study, you’re not going to starve. But, you’re putting more pressure on yourself for the following day to finish it. And by blocking your day out for one task, it’s more likely to get done instead of unrealistically cramming lots of tasks into one day. And if you finish the task in less than a day, you’ve then got time to start your next task. But why are time management methods so important? Because our to-do lists are never-ending and ever-increasing. And it feels good ticking things off, knowing you’ve used your knowledge and skills to complete something. And all of the things you’ve completed, you’re able to look back on as achievements. If you were to look back at all the time you spent chasing ‘urgent’ tasks, the achievements are sparse and this can feel demotivating. What would happen tomorrow if you didn’t do this now? And if the answer is nothing much, then it can wait. Instead, spend your time doing something important – you’ll feel all the better for it.